For their clean room production cells, Teva uses 36 pieces BRUSS weighing hand pallet trucks for the correct weighing of the coating layer. The barrel with coating material is placed on the weighing hand pallet truck filling/weighing tablets before and after coating, each coating tablets suite (room) consist BRUSS 6100 & coating machine. The systems configuration includes special fork dimension and special GLP printout layout. 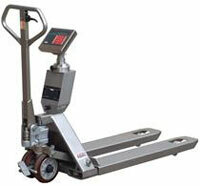 Weighing hand pallet trucks are also used for weighing row material before blending. Benefits: work is being done faster and more efficiently. Systems: 36 BRUSS 6100 with integrated thermal printer and footbrake. Teva Pharmaceutical Industries Ltd. is a global pharmaceutical company specializing in the development, production and marketing of generic and proprietary branded pharmaceuticals as well as active pharmaceutical ingredients. Teva is among the top 15 pharmaceutical companies and among the largest generic pharmaceutical companies in the world. All weighing hand pallet trucks are made of stainless steel for optimum hygiene and they are equipped with on-board printers to record the used weights in a safe and secure way. Another advantage of the mobile weighing systems is the fact that after each produces batch the production cell has to be cleaned according to a rigorous scheme. When using floor scales this was a time consuming job to clean the floor scale including the floor (or pit) under the floor scale. With a weighing hand pallet truck this cleaning process is much faster saving time and increasing production time, making the production machines more productive. Teva is studying the possibilities of Bluetooth data capture from the BRUSS weighing hand pallet trucks into their IT system.